Is there a cuisine that restaurateur Stephen Starr hasn't taken on? From Cuban to comfort food, from steak to seafood, the one-time Philly concert promoter has developed a trendy-restaurant portfolio that spans four states and the District of Columbia. One of his newest eateries, Fishtown's Fette Sau (1208 Frankford Ave., 215-391-4888), is a BBQ concept imported from New York City. Fette Sau - German for "fat pig" - is a collaboration between Starr and Joe Carroll, who opened the original restaurant in the Williamsburg section of Brooklyn in 2007. Like its northern sister, the Philly outpost has a communal vibe, with a wide bar and picnic tables. The exposed ceiling beams and unfinished walls give the interior a warehouse-like look. 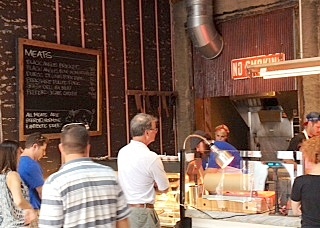 Since it takes some time to prepare each order - slicing the brisket and ribs, for example - diners are encouraged to grab a beverage from the bar. 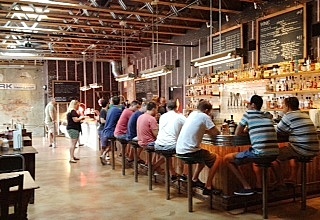 Jack's Cider is on tap and there are also five wines and a wide selection of American whiskeys and bourbons. 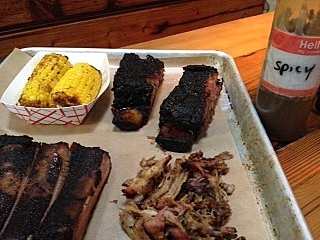 The lean, meaty pork ribs and pulled pork were the standouts. Both were flavorful enough that they didn't need the addition of the gluten-free spicy chili sauce. (The sweet BBQ and vinegar sauces are made with beer.) While short ribs are a family favorite, Fette Sau's renditions were exceptionally fatty and lacking much edible meat. With the exception of the baked beans, all of the sides, including the chipotle-buttered smoked corn on the cob that my wife ordered, are gluten free. There are several non-gluten-free baked goods for dessert, but two that are safe: salted caramels and the toffee-like Hokey Pokey made by Nunu Chocolates, also from Brooklyn. Is Fette Sau Starr's best effort? Not quite. For my money, the food elsewhere - El Rey comes to mind - is more consistent. But Fette Sau's addition to a revitalized Fishtown makes the restaurant scene there more diverse.